Search Results for: "garage door indicator"
[Sixerdoodle’s] garage door indicator tells him if the door is open or closed. He was inspired by the hack from last September but wanted to make it wireless. The setup uses an RF transmitter/receiver pair from Sparkfun, each controlled by an ATtiny13 microcontroller. We found his battle with RF interference from other devices to be interesting. Working out those bugs made for a great learning experience. How many times has this one happened to you? Just coming home from work, you walk in from the garage, settle down, and pick up the newspaper. But wait, did you remember to shut the garage door? Presenting the open garage door indicator. 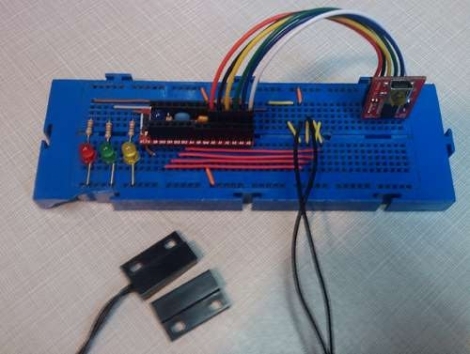 [xjc2010] chose the simplest circuit possible, using only a switch to turn on and off the setup, an LED acting as the signal, and a transformer/resistor combo to drop the voltage to an acceptable LED friendly 2.8 volts. We don’t like how he strung wire all over his house to place the beacon, and would have preferred something wireless in one way or another, but for under 6 bucks this gets the job done quickly and cheaply. Now if only we could get it to remind us if we turned off the oven while on vacation. Calling Canada home, Hackaday reader [TheRafMan] has seen his share of bitterly cold winters. He also knows all too well how hard it is to get his cars started in the morning if somebody happens to leave the garage open. After the door was left open overnight for the second time this last winter, he decided that it was time to add an indicator inside the house that would alert him when the garage had not been closed . Inspired by our BlinkM Arduino coverage a short while back, his circuit incorporates a BlinkM as well as several other components he already had on hand. He disassembled the garage door switch situated in the house and fit the BlinkM into the switch box once he had finished programming it. 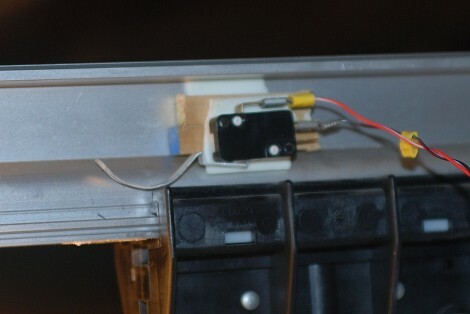 A set of wires was run to the BlinkM, connecting it to both a power supply located in the garage as well as the magnetic switch he mounted on the door. The end result is a simple and elegant indicator that leaves plenty of room for expansion. In the near future, he plans on adding an additional indicator strobe to let him know when the mail has arrived, not unlike this system we covered a few months ago. Stick around to see a quick video demonstration of his garage door indicator in action.